New Sea Dragon is a great companion to our Seahorse design. 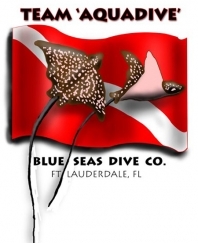 Our popular Rays on the Dive Flag can be personalized for your trip, your business. Island Image is the dive industry specialist in custom designed, custom printed t-shirts, polos, ladies shirts and any other garment you might need. With our NO MINIMUM, NO SETUP program, you only buy what you need, and because there are no minimums and no setups, you can easily try a number of styles to see what works for you! Our limited edition dive designs include customization for you in the design, where possible as well as your logo on the other side of the shirt, with no limitation as to the number of colors in your design. 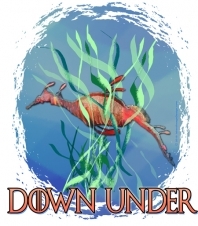 Divers, you can order directly from our website and shirts are printed just for you. Our designs can be seen in our retail catalog - just click here! Dive industry professionals, please feel free to look at our catalog and then, once you fill out our Retailer Application form, we will establish your account. Island Image is your prime source for trip shirts, retail, staff or special occasion items. Please feel free to call us anytime with your questions or comments. We handle orders for the dive industry over the phone (305.295.8061) or via email or fax and are happy to help you learn more about using T-shirts as incentives, added-value items for trips, and for advertising YOUR business. See our Dive and Tropical Tees section for more details. Imagine! Your business, charity, or group's name all over the world. And YOU make a profit as well! No, it's not a gimmick. It's T-shirts and imprinted logo ware! It's your logo, your identity, your business or special event. Why shouldn't your business, charity or event name be on the street daily? Island Image offers not only quality custom printing on a timely basis, but also graphic design services. Island Image is all you need to know about garment printing! Walking Billboards: Tees and polos highlight your business and are an excellent added value for your business's activities. Caps and jackets are available as well in embroidery, in various cost-effective programs. Retail sales of your own clever designs offers a profit as well as advertising your business. Employees become walking billboards for your business with this cost-effective uniform. Our new custom embroidery cap program allows you to stock a rainbow of colors. Flexibility: Our No Minimum, No Setup shirt print program lets you keep your staff smartly outfitted, and gives you plenty of breathing room to simply buy whatever you need, when you need it. Fast, friendly service: Our normal turnaround is 14 business days +/- on custom printing. Expedited service is also available for those last-minute needs. Embroidery and screen printing are available for jackets, caps and other items that may not be right for printing. Visit our Print On Demand section to learn more. Call us at 305.295.8061 or email us with your business' customized garment needs! We're eager to work with you! Island Image's No Minimum, No Setup program makes it easy to wear your boat for all to see. Our custom design team can bring your boat's image to life for custom tees, polos, tanks, ladies styles, or any other garment you might need. Tees make great gifts for friends, family and business associates and are always appreciated as door prizes for fundraisers. Our new cap program allows you to purchase an array of colors in embroidered caps, with no digitizing fee. Give your marine-based business a professional look at a low cost. Outfit your crew for a sharp, coordinated look. Your employees become walking billboards and don't forget retail! Your customers will love to wear your shirts and caps everywhere they go, worldwide. Bring us your design or let us design for you. Our art team can help give your ideas the bounce they need to be seen by all. Visit our Boating and Yachting section here to learn more.